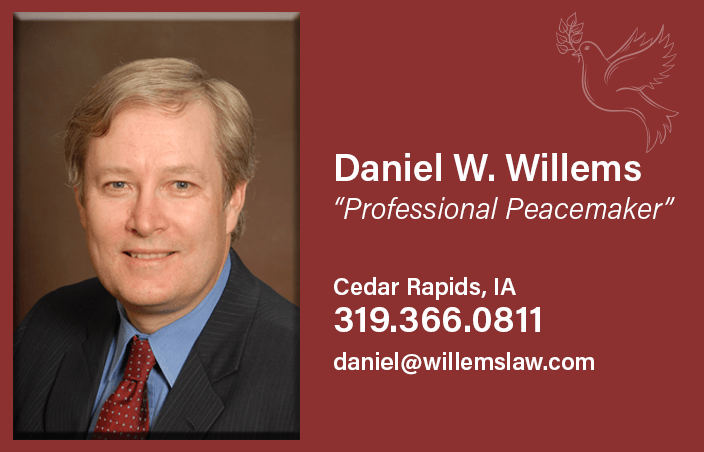 Daniel graduated from the University of Iowa Law School in 1985 and has been practicing law in the Cedar Rapids area since 1988. Daniel seeks to provide a peacemaking approach to conflict resolution, and to be an overall partner to you and your family for multiple situations that arise throughout your lifetime. 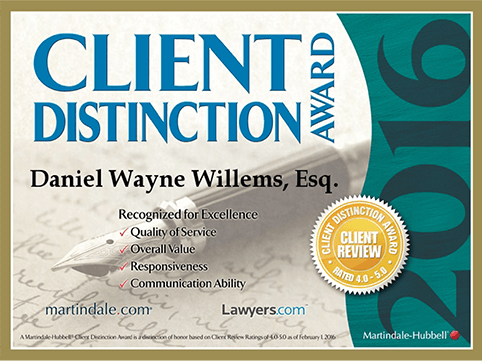 Daniel W. Williems also helps resolve conflict without going to court through mediation and arbitration. Daniel wants to provide your family compassionate law services through every stage of life. What sets this firm apart from others is a “peacemaking” philosophy which underlies services as attorney, counselor at law, mediator, and arbitrator. A peacemaker seeks to de-escalate conflict, open dialogue, explore win-win solutions, base argument on solid evidentiary proof and law, show respect, avoid vilifying the other side, and utilize cost effective alternative dispute solutions. A trial can be a method of resolving disputes. A peacemaker prepares for trial while working for a settlement. The purpose of this site is to provide basic information to the consumer of legal services to assist them in making informed choices. By accessing the various practice areas in the above menus, you will be provided summaries of Iowa law, tips and brochures. We hope you find this information helpful. This site provides information about the law stated in general terms. Do not regard the content of this site as legal advice. This site provides information about Iowa law only. Laws differ from state to state. While this site provides links to other sites. We have done nothing to insure the accuracy of information provided by these linked sites.